The schmaltz content gets higher and higher, as if administered through a drip feed, until by the end we are drowning in sucrose. People in Hollywood should never work with children or animals, W.C. Fields once said. Maybe that should be expanded to hyper-realistic computer-generated children and reindeer, too. As a spectacle, The Polar Express looks remarkable. As a film, however, it's the equivalent of an elaborately wrapped Christmas present containing a nice new pair of socks. Tom Hanks (in a number of roles) and the other actors do a nice job of voicing their parts, but the waxy animated faces they've been given are off-putting. At some point very early in the 3-D IMAX version of The Polar Express, technology trumps banality and you helplessly surrender to the shock and awe of this big, often thunderous movie. Director Robert Zemeckis once again harnesses a new technology to an engaging fable in this digitally animated adaptation of Chris Van Allsburg's holiday tale. A train wreck of mind-numbing proportions. As a complete package, Zemeckis' surreal, hallucinogenic adventure is pretty inconsequential. Strap yourself in and try not to vomit, because this is more of a theme-park event than a movie -- Pirates of the Caribbean in reverse, a wild ride stripped of its story, down to a rattling series of obvious, underwhelming effects. A failed and lifeless experiment in which everything goes wrong. Besides its dead-eyed cast, this 'animated' escapade is thrown off the tracks by pointless detours seemingly intended just to stretch the journey time. A truly satisfying holiday picture, the kind everyone can enjoy, and which may even restore a little lost childhood in many adult viewers. Without a trace of real live people, you get special effects that are not special, visual talking points without personality, virtual reality that is anything but real. Another powerful children's story dulled into mediocrity by the worship of technology. Faithful to its source but stretches it to the snapping point. Not only do Van Allsburg's darkly magical illustrations come to glorious life in the film; so, too, do his familiar words. Simple and evocative, yet teeming with intriguing visual effects. If I were a kid, I'd have nightmares. Come to think of it, I did anyway. Its heart is in the right place, and its bell should ring for many enchanted children in its audience. Barrels across the trackless landscape of our affections, arriving where no one would have thought to look for a big-budget Hollywood movie: in the terrain of the heart. An enchanting, beautiful and brilliantly imagined film that constitutes a technological breakthrough. Visually, taking its cues (mostly) from Van Allsburg's Hopperesque art, The Polar Express is eye-popping. Storywise, however, it can be eyelid-drooping. Climb on and you'll experience one of the great joys of moviegoing: seeing something that's like nothing you've ever seen before. Watching the dead-eyed population of Polar Express and their supposedly 'natural' movements made me think more of Gollum in "The Lord of the Rings" than anything associated with Christmas. A botched technological experiment of Tron proportions, cold, remote and creepy rather than engaging, warm and jolly. Devoid of 21st-century irony, this visually stunning, action-packed yuletide treat is sweet and, yes, magical in a way that will enchant kids and give older viewers a twinge of nostalgia. It's a sensation -- both a milestone in computer-animation and a likely Christmas classic. The key to enjoying this unique experiment rests, fittingly, on whether you are willing to set aside your own skepticism and go along with the movie's well-meaning and unmistakably original spirit. If so, it can truly be an exhilarating ride. I loved watching this movie; I loved even more watching children hugging mothers watching this movie. Zombies have their place, but not in Christmas movies. Looks as reassuringly retro as a 1950s Lionel train set still in its original box. Although it occasionally makes us feel as if whimsy has been run over by a train, Polar Express achieves some genuine enchantment, offering just enough storybook comfort to keep from flying off the rails. Polar Express honors its source, then exceeds it. Those human characters in the film come across as downright ... well, creepy. So The Polar Express is at best disconcerting, and at worst, a wee bit horrifying. A holiday oddity of the first rank: a breathtaking visual feast peopled by dead-eyed mannequins. It is a cold, distant and failed experiment, with a molasses-mired plotline and an obvious moral forced upon us like a mug of bad eggnog. I could probably have tolerated the incessant jitteriness of The Polar Express if the look of it didn't give me the creeps. There's a deeper, shivery tone, instead of the mindless jolliness of the usual Christmas movie. I only wish there were more of the disorienting -- more of the silently, hypnotically Van Allsburgian -- and less of the flat, linear, polished, technical brilliance with which this big-ticket vehicle runs its route. A delightful tale guaranteed to enthrall viewers of all ages. Based on the children's book by Chris Van Allsburg, this computer-animated feature is a grave and disappointing failure, as much of imagination as of technology. Entertaining and innovative animated film. There is wonder for us to cherish, courtesy of a spectacular visual sense. But there are also moments that deliver shock and awe instead, sequences of such exhausting, turbocharged jeopardy that it seems like we've wandered into a Jerry Bruckheimer movie. A wondrous, dazzling, eye-popping adventure. 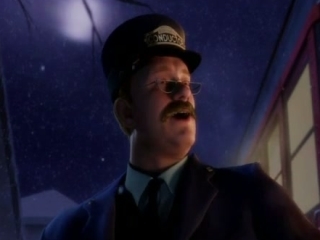 The Polar Express is a stunning technological achievement and, for the most part, a stirring emotional one. The movie seems determined to be an instant Christmas classic, but its idea of seasonal awe comes straight off a factory conveyor belt. Unnervingly smooth, mouths moving in strange, even frightening formations, the Polar people are the least convincing things on-screen, glaring impostors amid the otherwise painstakingly rendered scenery. The Polar Express remains true to the book, including the bittersweet final image. The Polar Express may succeed via the motion-capture process in replicating human movement by digitalizing the performances of live actors, but it fails to capture the subtlety of facial expressions or to fabricate sympathetic, evocative figures. The film is not sheer wizardry; it also has heart.